A fan-made GUMI concert will be happening on the 3rd of September at Nippon Daigaku Fine Arts Department, Ekoda Building's Music Hall. The concert will be held on the 3rd of September (3/9/2012). 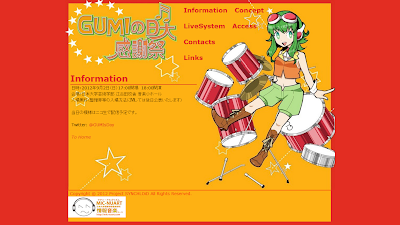 3/9 in Japanese can be pronounced as Gu (9) Mi(3) and this has been acknowledged by fans as GUMI's day. 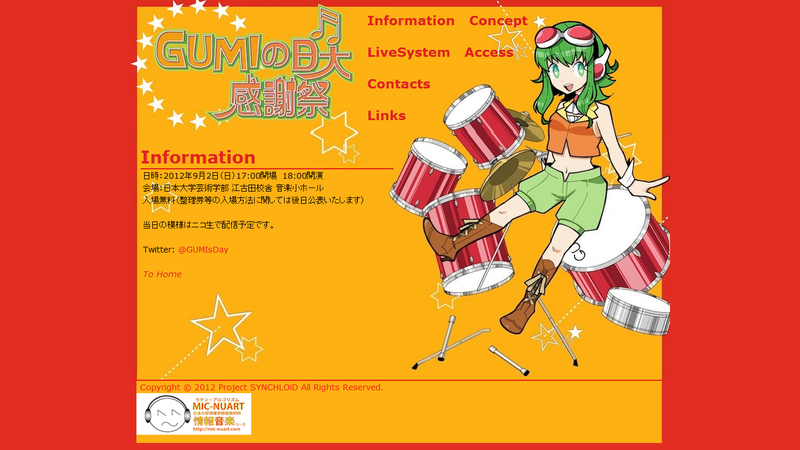 Using Nawota's SYNCLOiD system and Amid-P's amid screens, this will be a power up of previous GUMI's concert in Nicofarre. Here are the demonstration videos uploaded by Nawota. This is the concert demo footage. And here's the demo footage of SYNCLOiD. The event is of free entrance and a NicoLive broadcast will be arranged on that day.